Getting married is quite the event! The reception, the dinner, the dancing, the speeches, and at the center of it all: the ceremony itself. This short series of events is what legally binds you as man and wife, and what all of your friends and family came to see. 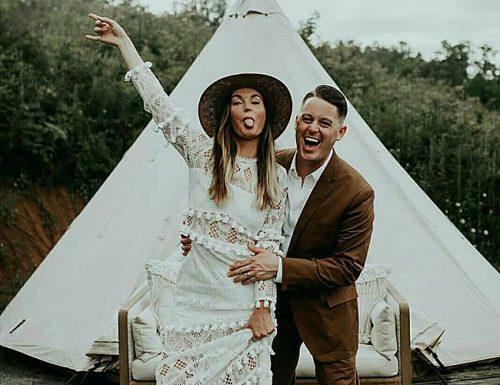 Many couples following religious tradition will have strict texts to follow, but in 2019 a lot of couples are paving their own way. 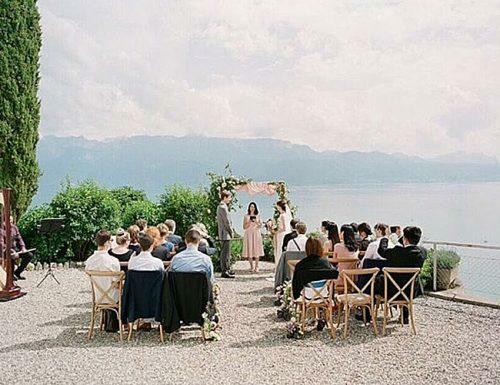 This means you have to craft your wedding ceremony script and we’re here to help! With so many non-traditional and mixed weddings, it becomes difficult perfecting things like wedding invitations, wedding programs, and (arguably the most crucial since it’s the legally binding portion) the script and wedding vows. We have plenty of wedding ceremony samples for all sorts of scenarios like this one. Pay attention and we’ll take the stress right out of it! You may add an outline of your ceremony into your wedding program. To start, here’s a short sample and the general structure that most scripts follow. Welcome, family, friends and loved ones. 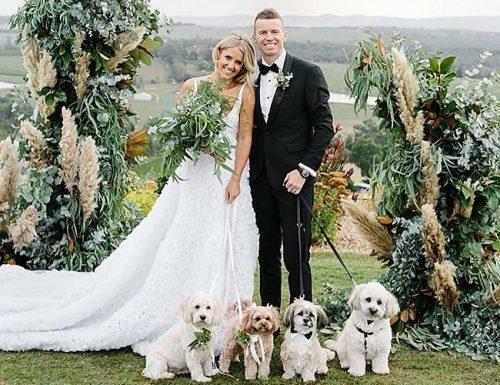 We are gathered here today, surrounded by the beauty of creation and nurtured by the sights and sounds of nature to celebrate the wedding of _____ and _____. 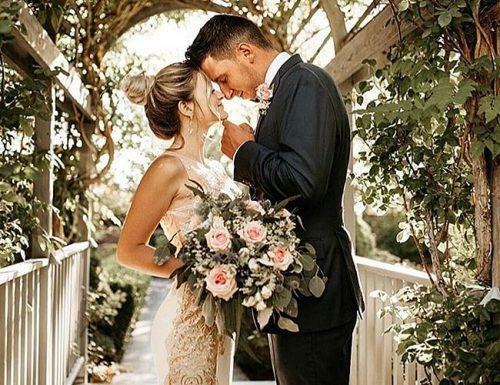 You have come here from near and from far away to share in this commitment now they make to one another, to offer your love and support to their union, and to allow ______ and ______ to start their married life together surrounded by the people dearest and most important to them. _____ and _____ thank you for your presence here today. They ask for your blessing, encouragement and lifelong support, for their marriage and life shared together. They also remember other loved ones who cannot be here to share this moment. _____ and ____, marriage is the promise between two people who love each other, who trust that love, who honor one another as individuals in that togetherness, and who wish to spend the rest of their lives together. It enables the two separate souls to share their desires, longings, dreams, and memories, their joys and sorrows, and to help each other through all uncertainties of life. A strong marriage also nurtures each of you as separate individuals and allows you to maintain your unique identity and grow in your own way through the years ahead. It is a safe haven for each of you to become your best self. You are adding to your life not only the affection of each other but also the companionship and blessing of deep trust. You are agreeing to share strength, responsibilities, and love. It takes more than love to make this relationship work. And it takes trust, to know in your hearts that you want only the best for each other. It takes dedication, to stay open to one another, to learn and grow, even when it is difficult to do so. And it takes faith, to go forward together without knowing what the future holds for you both. Officiant: Groom, do you take Bride to be your wife? I do. 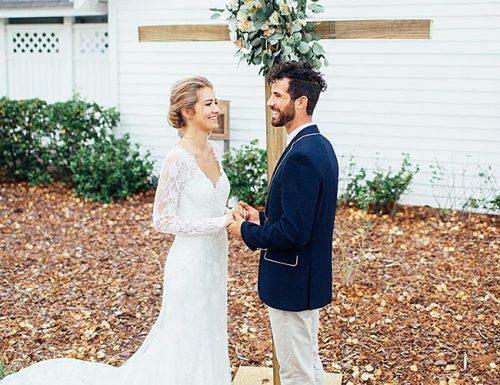 Officiant: Bride, do you take the Groom to be your husband? I do. Officiant: _____, please take _____’s hand and repeat after me. Your wedding ring is a symbol of your promise to one another. The ring, an unbroken, never-ending circle, is a symbol of committed, unending love. ______ and _____, you have come here today of your own free will and in the presence of family and friends, have declared your love and commitment to each other. You have given and received a ring as a symbol of your promises. By the power of your love and commitment to each other, and by the power vested in me, I now pronounce you husband and wife. You may now share your first kiss as husband and wife. Congratulations. Friends and family, I now present to you the newly married couple! If you’re ready, you can take the short wedding ceremony script sample and start making it your own. If you need examples for specific scenarios click through to the next pages. That’s exactly what we have for you. Modern ceremonies involve the “liberated” couples. They want to be free of the burdens if tradition and have their wedding the way they love it. Sometimes, the couple in question may practice different religions and want some compromise. 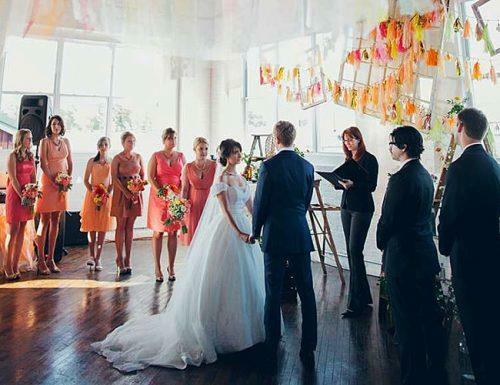 In most cases, modern weddings are multicultural and unusual, with many tweaks to proceedings. 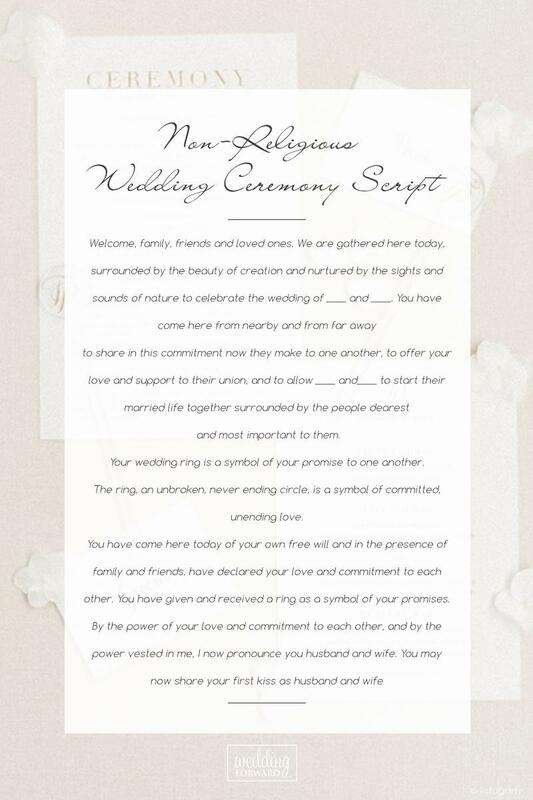 The template for a modern wedding ceremony script is not bulky but has some weight. Let’s see. The groom will wait for his bride at the aisle, as she walks down with her father. They will take readings from pieces like the union, by Robert Fulghum. The art of marriage, and oh! The places you will go by Dr. Seuss. You can also take readings from the Holy Books or favorite movies and poems. The couple will create their own vow, something from the heart. Below is one I created. You can tweak it to suit any gender. You may also personalize it by putting your name and other things unique to you. “we all witnessed this and we are well satisfied with everything. With the power vested in me, I pronounce you a couple. You can kiss the bride. Marriage is Joyful with the right person. And the person is right when they love, understand, care for and are patient with each other. Marriage is a gift box, you put in your best, to get the best out of it. I hope your love lasts forever. I give you my best wishes. The procession: The groom and his best men step in, then the bride and her father to a standing ovation. Welcome address: The officiant will welcome and address the guests on why they are truly gathered. The art of marriage and the importance of love. Readings from literature, poetry, movies or religion. Vows: the couple will make promises of eternal devotion to each other. Rings exchange: This is where they will each exchange rings as a symbol of their love. Closing remarks: The officiant will pronounce them a couple and present them to the guests present. Then comes the admonitions, advice and best wishes. 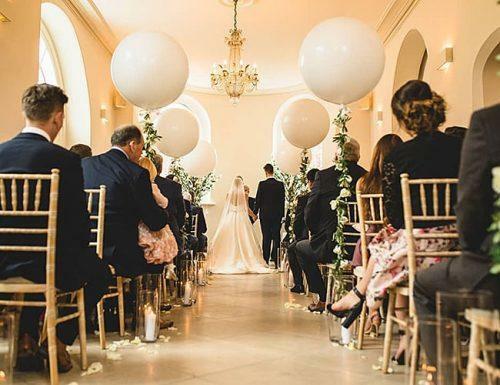 It’s all about following centuries of refinement when it comes to the traditional wedding ceremony script. Every single word and step has gone through the trial and error process and has been perfected to what we’re familiar with today. 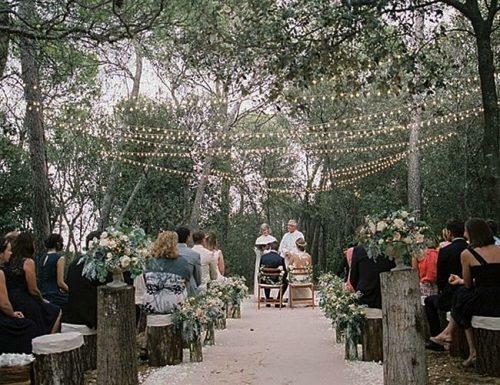 Although following a script is mandated, many modern ceremonies are adding love quotes or other personal touches. Make sure to coordinate this with your officiant if it sounds like something you’d like to do. This is the symbolic equivalent of signing a marriage contract. “_____ and _____, having witnessed your vows for marriage before God and all who are assembled here, by the authority invested in me, I now pronounce you husband and wife. You may now kiss the bride! Welcome address: Welcome the guests for taking time out to come to witness the joining of the couple on matrimony. Remind the guests that they are in God’s presence and the importance of marriage. Tell them about God’s stand on it, citing the Bible in reference. Congratulate the couple on taking the bold step and call them forward to begin. Wedding reading: Emphasize God’s view on love and its place amongst God’s people. Some of the popular wedding readings are from 1 John 4:7-12, 1 Corinthians 1 and 1 Corinthians 13 talks about God’s stand on love. It says even if we speak in tongues of men and angels but don’t have love in us. It is a waste of time. Declaration of intent: This is where they officiant will ask the audience “who gives this woman to this man?” The father of the bride will step out and affirm that he is in support of the marriage. The officiant will then ask the couple if they willingly agreed to marry, and not put of forcefulness. The couple will affirm. Today, I take you (name) and my lawful wedded (wife/husband). To love and to hold, for richer or poorer, in sickness and in health. Till death paths us. Closing remarks and blessings: The officiant will give some advice and best wishes, thank everyone for coming and ceremony over. Guests can now give their best wishes. 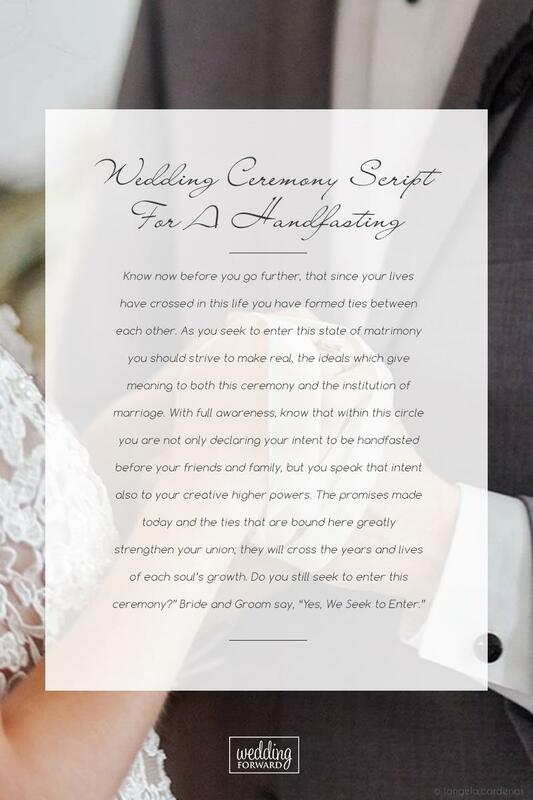 You’ll notice that there are a lot of similarities between traditional and Christian wedding ceremony script, but there are some key differences that you’ll want to pay attention to. Wedding vows have been updated over the past few centuries. Back then, a wedding ceremony was a legal process that transferred ownership of a woman from her family to her new husband. The vows had a fairly pronounced emphasis on the “obey” side of “love and obey”. Today wedding vows have a focus on love and commitment. Historically any exchange of an item of value was an acceptable part of the wedding ceremony. Over time, a ring became the overwhelming item of choice. Why? Because a ring has no beginning and has no end; just like a healthy the love you have for your future husband or wife. “May I have the token of Groom’s/Bride’s love for ______? “_____ and _____, since you have consented together in holy matrimony, and have pledged yourselves to each other by your solemn vows and by the giving of rings, and have declared your commitment of love before God and these witnesses, I now pronounce you husband and wife in the name of the Father and the Son and the Holy Spirit. Those whom God hath joined together, let no man separate. Jewish wedding ceremonies are chock-full of symbology. Centuries-old tradition comes alive with Jewish wedding ceremony script, which focuses equally on choreography, and scripted speeches. The husband’s resolve is tested as he attempts to recite a lecture based on this week’s Torah section and his male friends and family members attempt to distract him. Modern (conservative and reform) couples are including the bride and female guests at “the table”. The groom signs the marriage contract in front of the Rabbi and at least 2 male witnesses. At first glance, this seems as though the husband is ‘acquiring’ the bride, but it’s quite the opposite! Once the contract is signed it remains in the bride’s possession indefinitely. The is the ‘veiling of the bride’ in which the groom sees the bride for the first time and proceeds to cover her face indicating that he is purely interested in her inner beauty. Legend states that this is the result of Jacob being tricked into marrying his true bride’s sister. After a moment of verification that she is indeed his one-and-only, the ceremony proceeds. The ‘canopy’ has evolved over the years, but it remains the place where the marriage is officially consecrated once the couple has been left alone for a short while. Historically the canopy was adorned with rich colors and plush furniture. This is your best opportunity to customize the wedding and make it uniquely ‘you’. When the couple first enters the huppah, the bride circles the groom seven times, representing the seven wedding blessings and seven days of creation, and demonstrating that the groom is the center of her world. Conservative and reform couples repeat this process so that the bride is center of the groom’s world as well. The betrothal ceremony begins with greetings, a blessing over the wine, and a sip taken by the bride and groom. Aramaic is the language of law according to the Jewish faith, and this is what’s used to recite the biblical Song of Songs as the groom – and quite often repeated by the bride in some form – places the wedding ring on the bride’s right index finger. Seven blessings are recited including praise to God and a prayer for peace in Jerusalem. This is a great opportunity to allow the guests to participate by asking select friends or family to take their turn reciting. 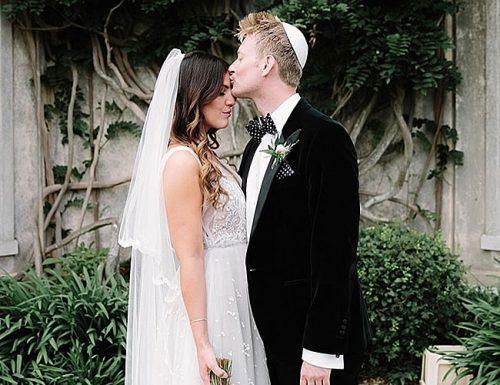 Almost everyone is familiar with this portion of the Jewish wedding ceremony, but even the devout have trouble pinpointing the exact symbolism here. a symbol of the destruction of the Temple in Jerusalem? a representation of the fragility of human relationships? a reminder that marriage changes the lives of individuals forever? After the whirlwind day, the couple is whisked off to their ‘tent of seclusion’. For 15 minutes the newlyweds enjoy their first moments of intimacy, their first meal together, or maybe just some peace and quiet and husband and wife before the big party start. Protestant weddings may seem the most familiar to you. It’s usually the type you see in movies! The most notable difference in the Protestant wedding is the structured opportunity for the audience to object to the marriage, and for the Bride and Groom to fess up to any reason that their marriage may not be legal. “Dearly beloved, we have come together in the presence of God to witness and bless the joining together of this man and this woman in Holy Matrimony. The bond and covenant of marriage was established by God in creation, and our Lord Jesus Christ adorned this manner of life by His presence and first miracle at the wedding in Cana of Galilee. It signifies to us the mystery of the union between Christ and His Church, and Holy Scripture commends it to be honored among all people. Although this is a very common introduction, check with your church to see how their version differs. Different churches have been known to add their own personal flavor to the wedding script. “Into this union _____ and _____ now come to be joined. If any of you can show just cause why they may not be lawfully wed, speak now, or else forever hold your peace. To the bride and groom: I charge you both, here in the presence of God and the witness of this company, that if either of you know any reason why you may not be married lawfully and in accordance with God’s Word, do now confess it. One at a time, to the bride/groom: _____, will you have this woman/man to be your wife/husband; to live together with her/him in the covenant of marriage? Will you love her/him, comfort her/him, honor and keep her/him, in sickness and in health; and, forsaking all others, be faithful unto her/him as long as you both shall live? Individually they reply: I will. To the congregation: Will all of you witnessing these promises do all in your power to uphold these two persons in their marriage? “Who gives this woman to be married to this man? “Those whom God has joined together, let no one put asunder. If you’re not family the Baptist faith falls under the Christian category of religions, and the baptist wedding ceremony script is not much different. 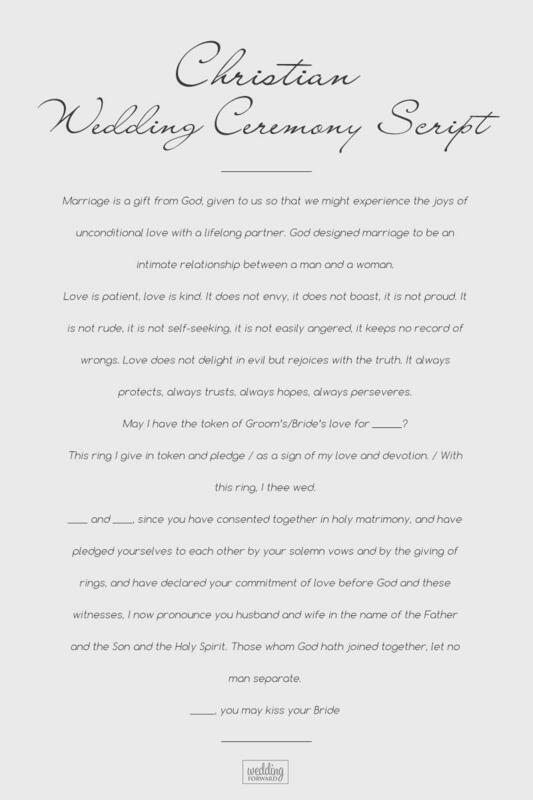 There is, however, a little bit of a spin on the familiar wedding vows. If your unsure as to what the defining difference is, Baptists believe in salvation in God alone – as opposed to the Father, Son, and Holy Ghost. Baptists also do not follow the Holy sacraments as the way to salvation. Since marriage is one of the Holiest sacraments, there will be a fairly significant difference here. If you’re not sure what Handfasting is, you probably wouldn’t consider yourself a Pagan. Ropes bind the couple’s hand throughout a ceremony which the bride and groom both profess their lifelong love and devotion to each other. This romantic wedding ceremony script is usually very personal with hand-written introductions, vows, and everything else. But, like all other scripts, a certain structure needs to be in place. “Know now before you go further, that since your lives have crossed in this life you have formed ties between each other. “Be aware before you proceed, that the day your paths crossed in life, you formed a tie. As you prepare to join in matrimony, endeavor to uphold all the ideals that make this ceremony and the institution of marriage sacred. Be notified that, within this circle, you declare your intent to willingly take a hand-fast before your guests and your creative higher powers. All the promises you make here and the hand-fast will greatly strengthen your marriage. They will grow with your soul through the years. The wedding sand ceremony is a significant way of joining two lives as one. This also creates room for couples who have children to blend their families. “(name) and (name), these two bottles of sand represent your individual life and all that you are. Your friends, families, and children; if any before today. Today we will blend this sand and you will not exist anymore. You will become one in love and married. And as the sand cannot be quite separated, so also you both cannot be well separated. I welcome you all and I’m thankful that you are here to witness and celebrate the love of Paul and Melisa. Father in heaven, we give you thanks for binding these two persons in love. We pray that you uphold their love. Make their love practical and give them hearts of patience and forgiveness. Today, we hand this marriage over to you. Will you have this woman as your legal wife? To love and cherish, protect and keep? In good and bad, until death takes you? With the power vested in me by the state of Georgia, I pronounce you man and wife. Welcome friends. We celebrate today. A day of commitment, friendship, promises and above all, love. We celebrate the joining of two people, their friends and families forever. Your meeting was not planned, but your joining today is deliberate. It is your choice to spend all your life with someone who supports you, loves you and helps you grow. So, do you (name), take (name) as your legal partner? To go through life with, laugh heartily with and wake up to? To cherish, love and protect, till you take your last breath? Love like these rings comes from serendipity and effort. Its beginnings are humble and low, but it stands the test of time, just like these rings. These rings are a perfect circle and have no end, so should your love be. Remember to wear these rings always. They are more than rings. They are pieces of you for each other. Treasure it and let it be a reminder of your love. With the power vested in me, I declare you wife and husband. You can now kiss the bride. “We come now to the words ____ and _____ want to hear the most today…the words that take them across the threshold from being engaged to being married. If you’ve been religious your entire life, it may surprise you to find how similar a secular wedding ceremony script is to your own faith. Procession: This is where the groom walks down the aisle or platform and then the bride. And all guests will rise to their honor. Welcome address: The celebrant will do his, by addressing everyone present. The officiant will tell everyone the reason for gathering and who is getting married. The officiant will say some things about love and marriages. They will also recognize the guests and those who could not make it. Reading: This is one of the personal parts of a ceremony. You can go traditional by taking your reading from any of the Holy Books. You can also take your reading from literature, movies, poems, songs, or you cook yours up! Intent declaration: This is where they officiant asks who gives the woman to Wed the man. The officiant also gets a reassurance from the couple that they marry willingly and not under coercion. Vows: Here, the couple will make their eternal promise to each other. You may decide to recycle your favorite movie, quote, poem or literature. But nothing beats writing your own vows straight from the heart. It is personal and unique. Blessings: The officiant will bless the couple and bless the rings. The celebrant will pray that the rings serve as a symbol of love always. The rings exchange: The bride and groom will put a ring on each other’s fingers with a promise of love. Pronouncements: The officiant will congratulate them, and give them his best wishes. The celebrant will also use the power vested in them to pronounce them man and wife. Closing & best wishes: The guests will give their best wishes to the couple and make cheer to their love. celebrate the wedding of _____ and _____. “_____, I take you as you are, loving who you are now and who you are yet to become, I promise from this day forward. To be grateful for our love and our life. To be generous with my time, my energy and my affection. “I’ve been wanting to say this for years and I can do that today finally. I willingly take you as my wife with this ring. To hold your hands through the years, loving you, cherishing you and protecting you. Wear this ring always, as it is a symbol of my undying love. The bride will say the same or create something of her own. After this, the couples receive good wishes from those present and they close. Many modern couples are choosing to ditch the guest list. Some do this for financial reasons, many more do this because marriage is an incredibly intimate thing and feel that an audience may dilute its significance. This is a growing trend that drops the stress of seating plans, speeches, and all of the other prep work that some brides dread. It’s just the 2 of you, we suggest writing your ultra-romantic (or simple, or religious, or…whatever you want!) wedding ceremony script together. There’s going to be fewer opportunities to create lifelong memories with so little (compared to traditional ceremonies) going on. Take advantage. If you want to create something unique, use Wedding ceremony template generator. A template generator allows you to choose what you want for every stage of your wedding script. Fill in your name as first partner and your spouse’s name as partner 2. Fill in your wedding date. Select the type of opening you want your officiant to go with. Select your readings. They range from literature to poems. Select the vows you prefer. Pick your ring exchange reading. If you want a unity celebration, pick your choice. This is as long as you make your own unity kit available. Select your ideal closing remarks. Pick your choice declaration of intent. Click on your ideal pronouncements. If you want something different, there’s the column for other pronouncements. And if you don’t want at all, click on no pronouncement. Make your notes and special request if any, in the comment box, and then submit. If you’ve come this far and have read through all of the traditional wedding script and unique wedding ceremony script ideas, you’ve surely recognized a pattern. Regardless of faith or style, the overwhelming theme is love and a desire to share it with the world. Open with an introduction, read a passage from the Bible, a book, or a movie, share your unwavering vows, exchange the wedding rings, kiss, and run off into the sunset.